When you need a truck or trailer repair, you don’t have hours or days to wait to have that accomplished. In most cases, you need to have those repairs accomplished in a way that has you on the road quickly and cost-effectively. In North Central Ohio, you don’t have to worry about finding someone to give you what you need. The kind of service and satisfaction that you’d expect from a major trucking company can be yours in small-town Ohio. For expert trailer and truck repair inclusive of roadside repair services, heavy towing, and tire services, A & M Truck and Trailer have you covered. We specialize in Hazmat cleanup and offer top quality repair services at cost-effective pricing. Our customers range from small trucking companies to large ones, from reefers to Haz-mat haulers and we repair and get them on the road with equal speed and outstanding service. We’ve been in the business of truck and trailer repair for years. We’re part of the local community and we believe in providing a quality service and a positive customer experience to our clients. Truck and Trailer Repair is a service that requires high skill. Haz-mat spills and cleanup bring with it inherent challenges that not every company can meet. A & M personnel are certified in Hazmat cleanup and are available 24/7 to provide the services. A&M Truck and Trailer Repair is small enough to offer all of our customers the kind of personal attention and detailed repair services that you want while being large enough to be able to feature all of the services that you may require. A&M Truck and Trailer Repair is a full-service truck and trailer repair located at the intersection of two major trucking routes. 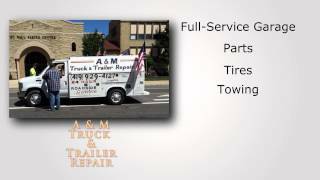 Part of North Central Ohio for more than five years, A & M Truck and Trailer Repair is conveniently situated at the intersection of State Route 224 and US Hwy 250, Greenwich, Ohio. OSHA certified Haz-mat cleanup technicians. The team of professionals at A & M Truck and Trailer Repair will provide you with safe, quality truck and trailer repair with a turnaround time that is as quick as we can possibly make it. Our goal is to keep your truck in peak condition and keep your costs as low as we can and A & M manages that with absolute precision. A & M Truck and Trailer Repair of Ohio takes great pride in our services to our customers and our record of customer satisfaction. For the kind of truck and trailer repair services that you need at prices that may surprise you, Call A & M Truck and Trailer Repair today at (419) 929-4127.